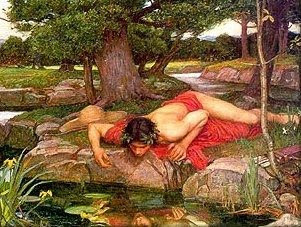 A narcissus flower is said to have bloomed in the spot after his death. 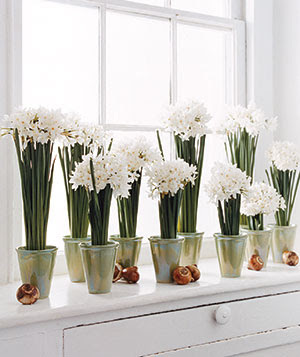 Every Winter I think about forcing paperwhite bulbs. 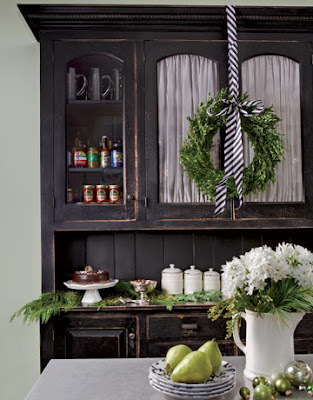 I just love the idea of having fresh flowers all winter & of course the small is insanely good. (I tried it one year but they don't do very well when you don't water them.) But THIS year, I'm doing it. I want that smell and I want those beautiful little white fowers all over my house. 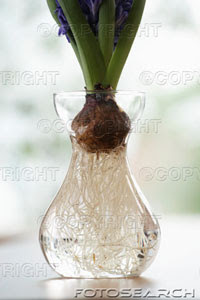 A neighbor of mine forces amaryllis & other bulbs as Christmas gifts & I think it's just a perfect idea. She times them so they're in bloom when she gives them. If you're anything like me & often a little short on time (and you're giving it to someone who you think might enjoy a mini-project & the waiting & watching for blooming bulbs) then you could also make them a pretty bulb-forcing kit with all of the ingredients needed: beautiful container, stones/gravel/etc., a bulb, and directions. 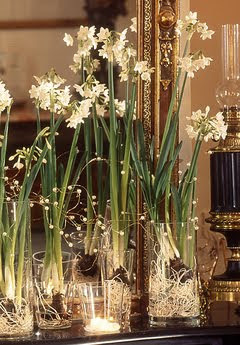 How perfect are these paperwhites in julep cups (real simple mag) below?! 1. 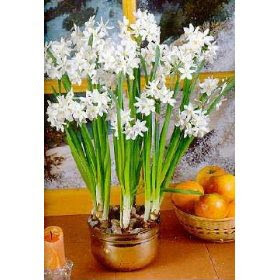 Pick your container: If it's tall, you won't need to stake the paperwhites when they eventually bloom, but if it isn't, be prepared to have stakes, chopsticks, etc. 4. They do best in a cool spot out of direct sunlight for a couple of weeks. After they root, put them in a bright warm spot to speed up flowering. (The author of the article says she just keeps them on her kitchen countr the whole time.) Once they bloom (4-6 weeks after planting) you might need to stake them with something to keep them from falling over. The year I tried forcing paperwhites, I used a faux conch shell. I saw this article from Cottage Living (below) and just had to make one! The problem (for me) was that because it was a faux conch shell, there wasn't much room for water and so it needed daily waterings and sadly, the love just wasn't there. The bulb never actually died but it had the tiniest nub of a shoot for 3-4 months and then it was Springtime and I gave up. But I think it would work beautifully in a real conch shell like the article recommended. SO, I'm going to give it a go this year & of course I'll take pics & show you how it goes when they bloom. I'm very impatient with these sorts of things but I'm going to try my best to water the bulbs this time!! 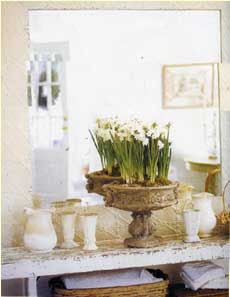 (Image below from Country Living) I want these flowers!!! I wrote about paperwhites recently on my garden blog. I included some tips for preventing the long, leggy growth that makes the stems flop over (this is the most common problem with growing these indoors). Beautiful images....I can almost smell their heavenly scent! Thanks for all the wonderful info. It always makes it easier when you are well informed and have all the right tools. They are so cute and will be able to get me through winter! I have so many "projects" in the planning stage that I hope I can include forcing bulbs indoors. 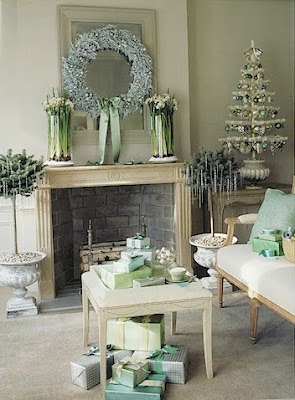 The one I especially want to do is a "table top Christmas tree". I just posted about it today. I can't wait to get started. I got some from a florist last year already going and the bloomed the week of Christmas (just like they said they would). I loved them, and this reminds me, I need to go grab some for this year! They certainly look beautiful, and I bet the smell is just heavenly! I'd love to have some in my own home! I always start mine around Halloween....and have blooms between Thanksgiving and Christmas. I also like to start some later so I have different sizes. Two big soup tureens of them on my kitchen table as I write! I get a dozen every year and have some in my office and some at home. They always add a good spot of cheer! One tip for stunting the growth so they're 1/3 to 1/2 their size (so they don't flop over) is to add alcohol. 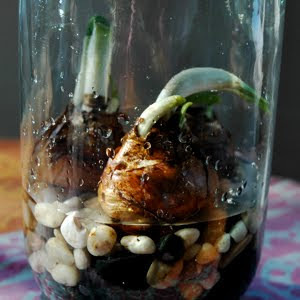 Once the roots begin growing and the shoots are 1-2", pour out the water, then replace it with an alcohol/water solution where the alcohol is 4-6%. Here's a good guide for how to get that %. But I always forget to water plants, so I suspect that if I tried to force these lovely bulbs/flowers I'd fail for sure :-( That's why I want to be on your gift-giving list HaHa! Do you think they'd ship very well across the border? Probably not!! Enjoy growing these lovely flowers!! I've already got them forced - I use paint cans - the quart size. I wrap the outsides with cute wrapping paper and give them as gifts. It's always a hit. * Lauren, they're one of the most FUN (& easiest!) things about the holidays!!! I usually do about 30+ every year... some in "big bunches", others in just small groups of 3-5 for very small areas, and always a few as hostess gifts in some wonderful piece I've "found" (for my gardening friends)... I think it's SOOO fun, soooo PRETTY and SOOO "personal"!!! GREAT BLOG today, & some new info for me!!! THANKS! What beautiful photos. I would be thrilled to be on the receiving end of a bunch of those for Christmas. Cant wait to see how you do with your ones. I remember years ago when one of the editors of Domino cleverly did a whole tray full of paperwhites then wrapped them one by one is burlap sacks to give as gifts. It was so pretty and affordable. Why can I never find the time to do it? Ha! Informative holiday posting! I started mine 2 weeks ago and have little sprouts a peepin'. Thanks for all of the tips and suggestions. I have always wanted to give growing paperwhites a try! i just bought a kit at Lowe's on Sunday. I may plant them today. Says should be flowering in 4-6 weeks. We'll see! 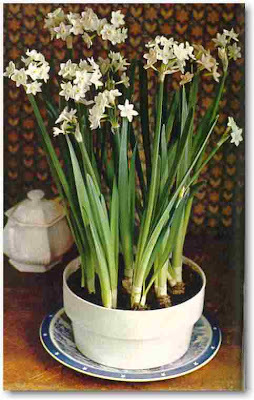 Love your post on paperwhites - great idea about the tea cups - I actually collect vintage tea cups and might have to try that or find some inexpensive ones and use those as hostess gifts with the paperwhites. I actually use a vintage silver casserole dish - I take the lid off and fill the glass part with water and bulbs and let the paperwhites grow. It's the perfect size and the dish is not polished so it looks vintage - you can find them at the flea markets. Lauren, I love this! I'm doing this for the first time this year too, and am so excited! My mother in law does this every year, and they have the most deliciously fresh fragrance without being overpowering. I especially love how sculptural they look whenforcing them in water not in a pot. I love the pictures you've collected. bulbs in. It's such a treat to have the aroma of fresh flowers in the house at this time of year.. I really need to try this! Thanks for the inspiration. 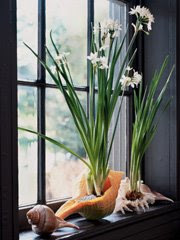 i LOVE paperwhites in my apartment...makes me want to grow them all year long!